I'm sitting here on a plane, flying to Minneapolis after signing 1280(!) books last night at the midnight release of A Memory of Light. That marks it as my largest signing ever, though a whole lot of readers (understandably) grabbed their pre-signed books and ran off to read them, rather than waiting for a personalization. A lot of people are asking what it feels like to be done. That's an odd question to consider for a couple of reasons. In some ways, the Wheel of Time was "done" for me when I read Robert Jordan's last scene back in 2007. The work wasn't done, of course, and I had a very long road ahead of me. And yet, I'd read the ending. We managed to get it into the final book virtually unchanged, with only a few minor tweaks here and there. The sequence (it is more than one scene) that I am referring to most of the time when I talk about this encompasses the entire epilogue of A Memory of Light. Once you get there, you can know you're reading Robert Jordan's words, though of course there are other scenes scattered through the book that he worked on too. So that was one ending, for me. Another came in January of last year, when I finished the rough draft of this book. Still, there was a great deal of work to do, but I was "done" after a fashion. From there, I transitioned from writing a new Wheel of Time book to doing revisions—and for the last time ever. Another ending came for me when I handed the book over to Maria from Team Jordan to handle all of the final tweaks from the proofreads and copyedits. That happened late last summer, and with some regret, I stepped away from the Wheel of Time. Like a parent (though a step-parent in this case) waving farewell to a child as they leave the home, I no longer had responsibility for this book in the same way. I was done. And yet, I wasn't. This month and next I'll be touring for the Wheel of Time. That will probably be the final ending, seeing all of you and sharing in your mixed joy and regret at the finale of this series. Over twenty-three years ago now, I picked up The Eye of the World for the first time, and my life changed. A lot of you have similar stories. I know how you feel. I've been feeling it for five years now, ever since I read that last scene. There is no glossary in this last Wheel of Time book. We wanted to leave you with the memory of that scene, as Robert Jordan wrote it, for your final impression of the Wheel of Time. I'm happy I can finally share that scene with you. After five years of waiting, I can talk about it with others and reminisce without having to worry about what I'm spoiling. I hope to chat with as many of you as possible in the upcoming months. For those who can't make it, I'll post some responses to frequently asked questions below. Question: Why aren't you coming to my city? And why do you so often go back to the same places? Answer: I wish I could get everywhere, but I'm only one person, and touring is rough on the constitution and on the writing. I do try to go new places on every tour, but I also do visit some places repeatedly. This is because certain bookstores and booksellers have supported me since the beginning of my career, when others weren't interested in having me. I feel it important not to skip these stores now that I'm releasing what will likely be the bestselling book of my career. Question: You said something about cover art prints of A Memory of Light? Answer: Yes! Brian from Joseph-Beth is one of those booksellers mentioned above. From the start of my career, he's been in my corner, rooting for my books to do well. (And he has probably hand-sold more copies of my books than any person other than myself.) He tends to do awesome things for booksignings. This time, he called up Michael Whelan and asked if he could somehow get prints of the cover to sell. Question: Any news on the Wheel of Time Encyclopedia? Beyond this, at the Q&A on Monday, Harriet revealed something I previously haven't been able to tell you but that I've known for quite some time—that Robert Jordan didn't leave much of anything in the way of notes for the Outriggers. There are, quite literally, only two sentences of explanation from RJ telling us what the plot of the outriggers was to be about. So no, no outriggers. I highly doubt you will see the prequels either, and for similar reasons. All good things must come to an ending. And this is ours. Question: Why a delayed ebook release for A Memory of Light? As the last books have all hit number one, she doesn't want to risk one of these not hitting number one, and therefore ending the series on a down note. (Even though each Wheel of Time book has sold more than its predecessor, including the ones I have worked on.) I personally feel her worries are unfounded, and have explained that to her, but it is not my choice and I respect her reasoning for the decision. She is just trying to safeguard Robert Jordan's legacy, and feels this is a very important way she needs to do so. After talking about the issue, we were able to move the ebook up from the originally planned one-year delay to instead come out this spring. I'll try to update the blog with more questions and answers as I think of them during the tour, or as people ask them to me. [Note: This will only occur on Brandon's website.] Thank you all for reading, and enjoy the final book. Just finished it!...Mr. 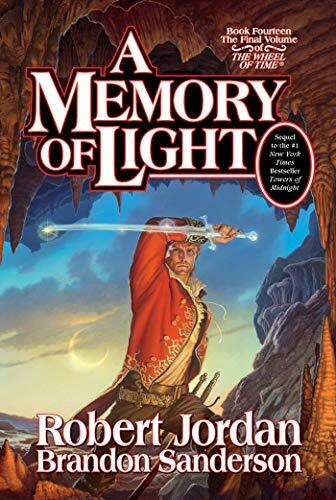 Sanderson you were the right one for the job to finish this epic series...and Memory of Light was FANTASTIC...one of the best reading experiences ever!